Natasha Harth was named the 2016 Armed Forces Insurance Military Spouse of the Year ® today in recognition of her outstanding commitment to the military community. Video of the awards ceremony is available on the website. Currently serving alongside her husband at Marine Corps Barracks Washington, Natasha also served as Military Spouse magazine’s 2015 Marine Corps Barracks Spouse of the Year. Natasha has improved the lives of military and local communities, spanning the distance between California and Washington, D.C. Her volunteer work includes supplying donations to battered women’s shelters, spearheading school supplies for inner city schools and leading military spouse mentoring groups. Natasha is the founder of the Be A Blessing project, which distributes food and supplies to the homeless of our nation’s capital. Through her charity, she enlisted the support of the Joint Base Anacostia-Bolling police department and Marines from the Barracks to walk the streets of DC with her family to distribute bags to the homeless. Due to the outpouring of support she received, she has enough supplies to do a monthly donation sweep for the next five months and has been able to secure donations of goods from major companies, including Dollar General. In doing so, Natasha has helped bridge a gap between our military and civilian communities through service. With the reach of the Military Spouse of the Year ® organization behind her, Natasha hopes to demonstrate the power of service and inspire military spouses across the globe to recognize their talents and their abilities to change a nation. "During each of the nine years of the Military Spouse of the Year competition, this program has grown in awareness, participation and recognition of the contributions military spouses make worldwide,” remarked Garry L. Parks, Lieutenant General, U.S. Marine Corps (Ret. ), Chairman of Armed Forces Insurance, the MSOY Title Sponsor. “On this occasion we specifically honor the 2016 Armed Forces Insurance Military Spouse of the Year®, Mrs. Natasha Harth, and applaud the dedication and contributions that earned her this unique recognition. We would be remiss, however, to not also acknowledge the thousands of military spouses who, each in their own way, are a force multiplier to America’s armed forces. On behalf of Armed Forces Insurance, I salute each of you!" Prior to announcing the overall 2016 Armed Forces Insurance Military Spouse of the Year®, the finalists from each branch of service were honored at the annual awards luncheon which was hosted at the Fort Myer Officers’ Club and attended by military and civilian VIPs. The Awards were also streamed live via the magazine’s website. These Branch Winners emerged from a pool of more than 1,500 nominees, advancing through three separate rounds of voting and a judges’ panel review. Initially the winner of the local level Marine Corps Barracks Washington Spouse of the Year award, Natasha was awarded the branch level 2016 AFI Marine Corps Spouse of the Year® title before ultimately being chosen as the overall 2016 Armed Forces Insurance Military Spouse of the Year®. The mother of two daughters, Natasha has been a military spouse for over ten years. The Military Spouse of the Year® (MSOY) Award was created and presented by Military Spouse magazine. "Over the past eight years, the MSOY Award has honored hundreds of military spouses for their advocacy and support within the military community. We couldn’t be happier to be welcoming Natasha into this family," said Suzie Schwartz, VP of Military Spouse Programs and spouse of former Air Force Chief of Staff General Norton Schwartz. For more information on the Military Spouse of the Year® Award, please visit http://msoy.militaryspouse.com. 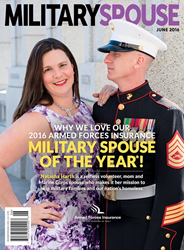 2016 Armed Forces Insurance Military Spouse of the Year® Award Military Spouse magazine Victory Media, Inc.